Coconut oil can serve as a natural and effective remedy for many scalp and hair issues. So, how to use it? There are 5 ways that are easy to follow. Coconut oil has been used as a beauty treatment for centuries. It not only benefits your outward appearance but when taken internally as cooking oil, coconut oil can also have very positive effects on your overall health. Coconut oil can aid in lowering cholesterol, losing weight, strengthening immunities and treating infections. Full of antioxidants, coconut oil also possesses antiviral, antifungal and antibacterial properties. You can consume coconut oil directly, use it to cook food or apply it straight onto the skin and hair as a beauty treatment. It's the all-purpose, super product. Read on for more information about its benefits and how to use coconut oil for hair. Since coconut oil is so rich in fatty acids like lauric acid and linoleic acid, it can provide major benefits for hair. The antioxidant, antifungal, antibacterial and antiviral properties found in coconut oil make it the prime candidate for keeping hair healthy. Coconut oil also has very high amounts of medium chain triglycerides, or MCTs, which are the main components for promoting healthy hair growth. Most of these properties help keep hair healthy from inside out - as a part of your diet. Hair won't absorb the nutrients, but the oil will help impart a healthy, vibrant sheen to the hair. 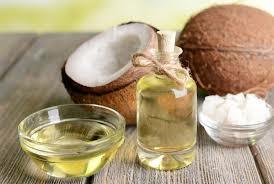 The antimicrobial properties found in coconut oil are excellent natural treatments for various scalp infections. It is an effective lice treatment as it kills both the eggs and adult lice that attack the hair and scalp. You can get rid of dandruff by using coconut oil because it seeps deeper into the hair shaft, providing lasting conditioning without the harsh reactions of chemicals found in other conditioning treatments. Regular use can also aid in treating balding and provide overall scalp and hair care. Everyone uses shampoos, conditioners and other hair products on a daily basis. After some time the formulas and ingredients in these products can wear down our hair, causing it to thin, lose pigmentation, become brittle, break and even fall out. Coconut oil can repair this damage. Look for virgin coconut oil over refined oil as the former will still contain the active components needed for healthy hair in their natural form. Below are some great uses for coconut oil on the hair. Add coconut oil to your daily hair care regimen. Your hair will display added shine, volume and a major boost in healthy growth. The overall health and strength of your hair will improve. The proteins and certain other nutrients found in natural coconut oil provide a big boost in promoting healthy hair growth and development. Apply the oil frequently for best results. You can leave it in your hair overnight or wash it out after a few hours. Rinse your hair with a mild, chemical free shampoo to ensure there is no excess oil left behind that can make hair appear greasy. This is another way for how to use coconut oil for hair. A consistently dry scalp generally means there is a lack of moisture in your hair follicles. To remedy this, you can use coconut oil as a conditioning treatment to restore moisture. Rub the oil either with your palm or finger tips into the scalp and roots of your hair for a soothing and conditioning effect. You can also make an oil mixture for this. Combine coconut oil, geranium oil and rosemary oil for added conditioning results. Also, make sure you stay properly hydrated! Warm some coconut oil over low heat for a few minutes. Make sure it is not too hot and that you can touch it and rub it on your hands comfortably. Massage it all over your scalp, making sure to pay attention to areas with the most trouble. Leave the oil to set for some time and then rinse with a mild but good anti-dandruff shampoo. You can also mix lemon juice and coconut oil together and rub it into your scalp before bed. Wash it out the next morning and practice this about once a week for continued dandruff free hair. Coconut oil can nurture and repair even harshly damaged hair. Heat from products such as blow dryers, straightening irons or curling irons and chemicals from hair dye, shampoos and styling products cause hair to lose much needed proteins that keeps hair strong. Damaged hair is often brittle and dry due to a loss of natural hair proteins. Coconut oil contains these hair proteins and can provide complete nutrition to the hair follicles to make up for the proteins they have lost. How to use coconut oil for hair? Make the oil slightly warm and apply into the scalp and hair, working from the top down to the bottom. Leave the oil for about an hour; then rinse gently with an herbal shampoo. You want to be sure it is a shampoo that does not have the harsh irritants that caused the damage to your hair in the first place. If you're going to use coconut oil for your hair, be sure you pick up a quality bottle of virgin oil. Use must be consistent in order to see and maintain proper results. This is why it is suggested to add coconut oil into either your daily or weekly hair care routine. You do want to take care that you are not overusing the oil. Applying too much can give hair a greasy and unwashed appearance. It can also clog the pores and hair follicles if you are not thorough enough in washing it out. How to get thick hair? There are many ways, including everyday care tips, natural hair care techniques, professional hair and scalp treatments, and more.